Recently, I’ve been reading a lot of articles that seem to promote one food, one type of exercise, or one form of medicine above all others, as if that bit of information was all I needed to live a healthy lifestyle. While I appreciate reading up on the latest trends, especially if they do promote better health through regular exercise or an improved diet, I can’t help but point out that making just one change to your diet or overall lifestyle isn’t the key to better health. Take omega-3 fatty acids and antioxidants as an example. Omega-3 fatty acids can improve your cholesterol profile by increasing good cholesterol and decreasing bad cholesterol. Likewise, catechin antioxidants, found in chocolate, coffee, tea, wine, and other sources, can help boost your overall health by promoting cellular strength through their antioxidant properties, supporting vasodilation and improving blood flow. These are just two examples of nutrients that provide some great health benefits that can lower your risk for disease and potentially improve the quality and length of your life. But they can’t do it alone. There is a much longer list of nutrients and foods that provide specific benefits to your health, and no one is more important than the others. All of the vitamins, minerals, healthy fats, and antioxidants found in a vast variety of nutrition work together to impact your overall health. Your health is like a pie; it takes a number of pieces and ingredients to create an entire pie. For better health, the pieces of the pie are nutrition, activity, balance, and knowledge. When you put these things together and try to make the right decisions most of the time, you’ll likely feel better and live longer. To maximize your health, lifestyle is essential. You need to make conscious decisions about how you want to live and what you want to eat. You might not lose weight or see the results of your lifestyle in the mirror, but that still doesn’t mean you’re not doing your body a favor. In fact, there are probably more unhealthy thin people than you likely realize. There are also some overweight people who have tremendous fitness. Sometimes, genetics and other factors make it harder to see the results, but you can still feel them. And don’t worry about filling your shopping cart just with superfoods and supplements. In fact, unless you’re deficient in a particular vitamin or mineral, you really have no need to target such things. Keeping a balanced diet that’s full of various fruits, vegetables, fish, lean proteins, and healthy fats should give you everything you need. In many cases, nutrition is the best source of vitamins and minerals. Certain foods and supplements are often branded like they can change everything. Blueberries, for example, get a lot of praise. Don’t get me wrong; they are great for you, but they alone will not substantially alter the trajectory of your health. One example: adding blueberries to three scoops of ice cream definitely nullifies the benefits! Adding blueberries to a bowl of oatmeal, however, is definitely a good choice. I’m not trying to draw a line in the sand and say you’re either one of “us” healthy people or you’re not, that it’s all or nothing. I’m simply saying that you can influence your health and ability to prevent disease. 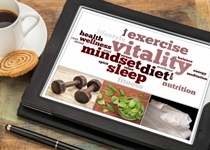 In fact, it’s called practicing a “preventative lifestyle.” It’s not guaranteed to work, but it does increase your odds of improving your quality of life. So instead of reading just one article and sticking to its advice, do what I do and keep informed about how to better your health by reading regularly and taking a holistic approach to a healthy, preventative lifestyle by combining all the knowledge each article has to offer. Lorenz, M., et al., “Green and black tea are equally potent stimuli of NO production and vasodilation: new insights into tea ingredients involved,” Basic Research in Cardiology January 2009; 104(10: 100–110, doi: 10.1007/s00395-008-0759-3. Reid, K., et al., “Effect of cocoa on blood pressure,” Cochrane Database of Systematic Reviews 2012; 8: CD008893, doi: 10.1002/14651858.CD008893.pub2. Yates, A., et al., “Evaluation of lipid profiles and the use of omega-3 essential Fatty Acid in professional football players,” Sports Health January 2009; 1(1): 21–30. Guallar, E., et al., “Enough Is Enough: Stop Wasting Money on Vitamin and Mineral Supplements,” Annals of Internal Medicine 2013; 159(12): 850–51, doi: 10.7326/0003-4819-159-12-201312170-00011. “Four Specific Health Behaviors Contribute to a Longer Life,” Centers for Disease Control and Prevention web site, August 31, 2011; http://www.cdc.gov/Features/LiveLonger/, last accessed February 3, 2015.